You can see that the a7RIII curve is closer to the ideal straight line. The a7RII curve bends over. 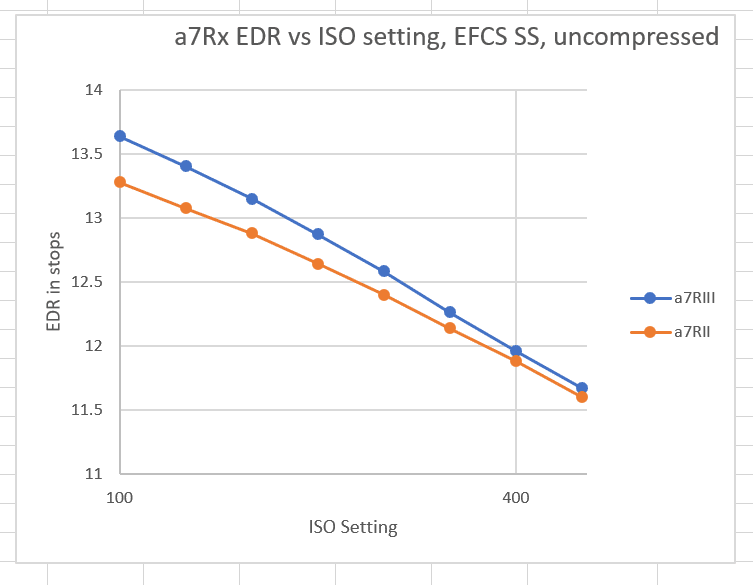 Bill Claff has noticed this also and speculates that the reason is that the a7RII did not actually have a 14-bit analog-to-digital converter (ADC). He thinks the camera got to 14-bit precision by making 4 12-bit conversions and summing the results. It looks like the a7RIII actually has a 14-bit ADC. It could be that there’s another source of additional post-amplification read noise in the a7RII, but I’m thinking that bill is probably right. I have a test that I can run that should shine some light on this issue, but it’s pretty involved and it’ll be a while before I get to it. Great Jim, I am wondering, if the a7rIII really “have” 14bit, or still “supposed 14bit-compressed”?!. It seams, it does, yet. So, I can order it now. Thanks a lot Jim. Uncompressed raw appears to be actually 14-bit precision if we ignore the digital scaling.